The Cambridge Faculty of Divinity is pleased to announce that the 2015 Yerushah Lecture will take place at 5 p.m. on Tuesday, 10 March, in the Runcie Room, Faculty of Divinity, West Road. 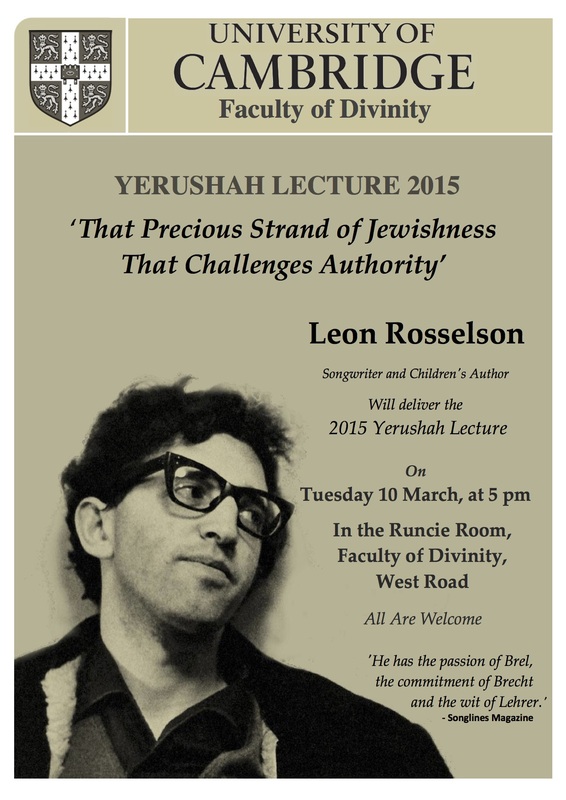 Leon Rosselson, songwriter and children’s author, will speak on ‘That Precious Strand of Jewishness That Challenges Authority.’ Mr Rosselson has been described by Songlines Magazine as having ‘the passion of Brel, the commitment of Brecht and the wit of Lehrer,’ and song performance will be incorporated into the lecture. All are welcome, and refreshments will be served following the lecture. The annual Yerushah Lecture in the Faculty of Divinity was established with a benefaction from the Righteous Persons Foundation, created by Steven Spielberg from the proceeds of his 1993 film Schindler’s List. ‘Yerushah’ is the Hebrew word for ‘heritage’. The Yerushah Lecture is devoted to Jewish heritage in all its aspects, with an emphasis on the transmission of Jewish identity and values across the generations.